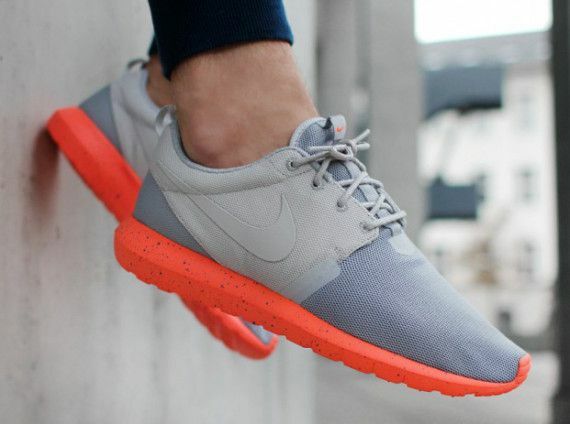 We sometimes wonder whether the Nike Roshe Run was the sleeper we thought it was. Creeping into the Nike Sportwear line without a single press release, the deconstructed, sock-like fit and faint aura of tech about it, as Lunarlon and Free soles started to walk the once-retro saturated streets, seemed to capture the spirit of the times. Zen meets zeitgeist. The jaded dude who hates everything could bust out a pair, the Air Max 1 brigade could bring it into a streetcar wardrobe and those dudes who think they looked good in a technical runner and tailoring could try it too. It was a shoe for everyone. In the office there’s a few dissenters, but the Roshe Run seems to be a crowdpleaser when it’s not tricked out for trail or given a load of extra panels. Looking at this shoe’s bloodline, it’s the easy going nephew of Air Mocs and Sock Racers — it’s pure Nike rather than some dimwitted attempt to make a shoe that doesn’t look like a piece of athletic footwear and it’s how a lifestyle shoe from a sportswear brand could and should be. Once the Roshe became a Quickstrike, we knew that we were going to see a lot of a shoe that’s popular as well as cheap to make and now they’re even stocked in JD Sports in plentiful supply. Was that the plan all along? We reckon Nike knew this shoe’s commercial appeal from the start somehow. Before we get too Alex Jones on you, nothing has touched the black and white, olive and whites or women’s blue and greys yet when it comes to this model, because we think that slab of blank white foam is what makes this shoe great. These QS Roshe Runs match the sole to the mesh, but have a split personality via the sudden slap of neon the medial side and lacing. It’s a curious addition to a formula that’s pretty much three ingredients (if you consider the Lunarlon texture sockliner) and needs little to no extra additives, but these aren’t bad at all. We’ve notice the output from other brands too, where designers seem to have been ordered to.